Last week we wrote about the widespread misconception that 2018 is a robust year for investment returns in The Curse of the Diverse. On the contrary, 2018 has been a challenge. Since that note, equities have deteriorated further. The leadership of the market for the last several years – large cap growth – has experienced an additional breakdown. 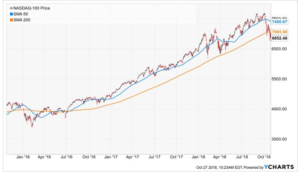 The below chart of the Nasdaq 100, the 100 largest stocks by market capitalization in the Nasdaq index, which is heavily oriented toward growth stocks, broke further below its 200-day moving average (orange line). As you can see above, the Nasdaq 100 has seen breaks below its 200-day moving average over the past three years, twice in 2016, as a matter of fact. This time may be different (famous last words). For the first time during this bull market, commentators are beginning to gently question the fundamental business models of the market’s tech-heavy leadership. As we referenced last week, the only thing left of this bull market is large cap growth. If it doesn’t rebound, the larger market could face significant downside pressure. The good news if this pressure materializes – although painful – it will create opportunities for disciplined investing. Short-term pain is never fun, but we feel energized seeing fundamentals return to markets. If you have concerns about your portfolio, please contact us. We remain confident in our portfolio construction and we value the opportunity to discuss it. Please visit www.atwatermalick.com/ria for full disclosure materials related to recommendations contained in this update.